The question why in therapy. Does it help to know why? 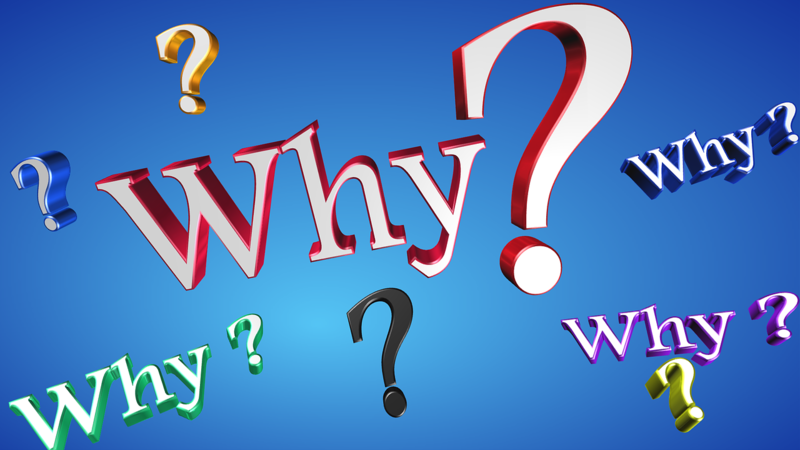 More than half the time in most therapy sessions is spent on the question why? Most of the time the focus of the why question, is not on the client but on some other person in their life. Clients spend a good deal of time asking me why their partner did this or that, why did their parent do something and so on. It would be reassuring to know why. Most of us think if we just knew why then we could prevent something bad happening. The great illusion of most relationships is that we can somehow control the behavior of others. Most of the time we can’t control the others in our life, and except for teaching our children good behavior, controlling others is probably not healthy. The questions we should be asking are not about others. More helpful questions are the ones we ask about ourselves. What do I really want out of life, what are my values? How much am I willing to invest in reaching my goals? Can I accept this situation? What am I willing to do to change? Sometimes we focus on others to avoid looking at ourselves. It is easy to upset yourself about things happening in the next apartment, across the street, or across the country. Looking at what is happening in your own life is more productive. It is also more challenging. People like to vent about their partner, their boss or their children. It would be easy to devote a lot of therapy time to talking about others. Conversations between friends often turn to talking about others. We call that practice gossiping. It is easy to do. We may even think that by discussing others we can gain some insight into the situation, some way to improve our outcomes. One thing we tell clients in therapy is that it is not productive to talk about people who are not in the room. Taking about your conflicts with your partner may make you feel better, temporarily, but it won’t change the situation. There are two ways to improve this relationship situation, get the other person in the therapy room or change yourself. Marriage, Child and Family Therapist’s work from a “systems” perspective, to change a family situation it helps to get all the people involved in the room. Often the “identified patient” is not the one with the problem. Let’s look at some examples of this situation. Mother comes in with her teenage child. The child has a severe weight problem. The child has become depressed as a result of being overweight. Despite mom’s best efforts to put this teen on a diet, make them exercise; the teen continues to gain weight. The teen comes to therapy; they don’t want to talk about their weight. What is on their mind is the way their parents have been fighting and every time they go to visit grandma, she runs mom down the whole visit. Turns out that because of the marital conflict, every time dad takes this teen out they stop somewhere for something to eat. Dad always says “don’t tell your mother, she is way too hard on you,” which the teen tries to respect. When the teen visits grandma she does the same thing, makes excuses for why the teen does not need to lose weight and rewards the teen with food treats. Grandma does not like her daughter-in-law and gets even with her by being the teens “friend” and sabotaging the mother’s plans for the teen to lose weight. Working with the teen around weight loss may not be very effective. One approach is to get the whole family together at once and talk about how they are all colluding to use the teen’s weight as a way to try to control or get even with other family members. Sometimes we can’t get the whole family to therapy. We have to work with the teen on what they really want. If the teen is impacted by this weight issue we may need to help them to learn how to say no to dad and grandma’s efforts to sabotage their diet. Some teens can’t resist the family dance and are stuck. Boys escape this family dance by joining the military or running away from home. Girls try to escape by getting pregnant, moving in with a man or some other way of having to leave the family. Both genders may also use drugs and alcohol to escape the intolerable conflicts. Another situation that results in a lot of talk about a person who is not in the room is the spouse of the alcoholic or addict. They are likely to want to spend a lot of time on how to make their partner stop or on what they did to make them drink and use. The spouse did nothing to make their partner abuse substances. A bad relationship may have contributed but it is not the cause. People drink and use to change the way they feel, eventually they lose the ability to cope without the substances. Some people can use and drink a little or even drink a lot and then stop when they want. Other people find that when they try to stop they can’t. We consider this an example of the disease of addiction. There is not much the non-using partner can do to stop the other person’s substance abuse. They have a choice. End the relationship, say that this is more than they signed on for and they are done, or they can accept that the other person is the way they are and go on from there. Spending time talking about the person who is not in the room is not helpful here either. Do you spend a lot of time asking why others do what they do? How much time have you spent in looking at yourself? What do you really want? What can you accept or not accept? Don’t waste time on the why; work on the “what and how” of the changes you need to make to have a happy future. This entry was posted in Counseling and Therapy and tagged Adolescence, Asking why in therapy, Family therapy, relationship issues by David Joel Miller. Bookmark the permalink.